There are a lot of PC case form factors out there. Not enough to be blown away, but just enough to make you scratch your head. Amongst the ranks of PC cases, there are small form factor cases, some being smaller than others. The micro ATX fits into this particular niche. While mATX cases aren’t the smallest out there, they offer a balanced blend of performance and size, taking up significantly less desk space than a mid-tower, but offering much greater performance and more expansions slots than an mITX. Many would argue that this makes mITX cases the best of both worlds. Knowing this, we’ve set out to find the best of the best in this balanced category of cases (try saying that 5 times fast!). We rounded up our top ten picks and included a buyer’s guide below to help you find the best micro ATX case for your needs. Near the top of any case roundup is almost guaranteed to be a case from amongst NZXT’s H-series lineup. This flagship line offers some of the most meticulously designed cases on the market today that have a variety of user-friendly features that make them easy to build in and great for tons of different builds. For our focus today, we’re going to the looking at the H400i, the microATX case of the H-series lineup. 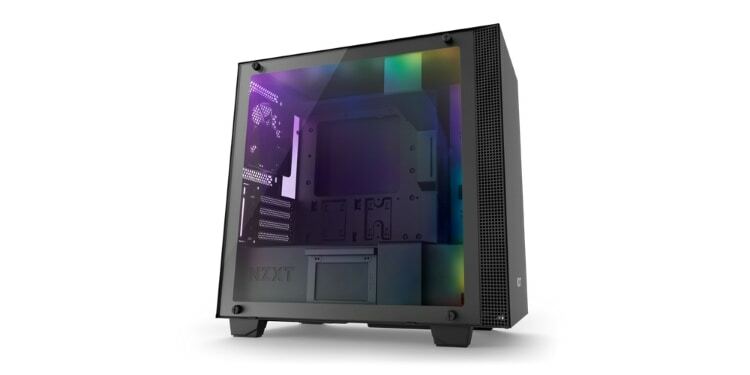 This case comes with NZXT’s excellent cable management channel design as well as an all-steel construction that makes it one of the most durable (and also heaviest) cases on our list. There is a tempered glass side panel on one side of the case, while the other side behind the motherboard tray has a plain side panel. All of the “i-series” cases within the NZXT lineup come with some added built-in functionality. The H400i comes with three Aer 120mm fans in addition to a built-in RGB and fan controller that can control the included RGB strip through NZXT’s HUE+ software. The simple layout inside this case makes it suitable for almost any build. It can accommodate graphics cards up to 411mm in length and CPU coolers up to 164mm in height. It can also fit some simple AIOs and water cooling, but only up to 120mm radiators. Water cooling is hands down the best way to get the most out of your hardware. The lower temperatures will offer both a greater lifespan and superior performance, especially if you have an interest in overclocking. The rewards of water cooling are even great with a smaller form factor micro PC case. In smaller cases, the air inside the case gets much hotter which decreases the performance of air coolers and heatsinks, but a water cooler will be able to cool efficiently, even in a smaller space. When it comes to water cooling in a micro computer case, nothing can come close to the Crystal 280X from Corsair. You can cram up to three large 240mm radiators into this case, or up to six 140mm radiators. With this much cooling capacity pretty much nothing is out of reach in terms of performance. On top of this, it also looks great with tempered glass on the front, top, and side. The 280X also comes with a pair of very nice 120mm RGB fans from Corsair and a lighting node pro to control the RGB lighting. For those looking for a highly modular case that allows for a huge variety of different layouts, then the Phanteks Enthoo Evolv is our strong recommendation. This case sports tons of options when it comes to layout, fans, drive bays, and even radiators. For starters, there are tons of drive bays in this case for its size, flaunting three 3.5” bays, an impressive five 2.5” bays, and even a 5.25” bay for a CD reader in the front. If the 5.25” bay is moved out of the way, however, you can fit a massive 200mm fan in the front instead for tons of cooling. For even more cooling you can also fit up to two 120mm fans or two 140mm fans in the top as well as the front of the case, plus another in the rear of the case. Alternatively, you can outfit the case with a 240mm radiator in the top and front, plus a 140mm radiator in the back. This layout, however, would require you to sacrifice quite a few of the drive bays. 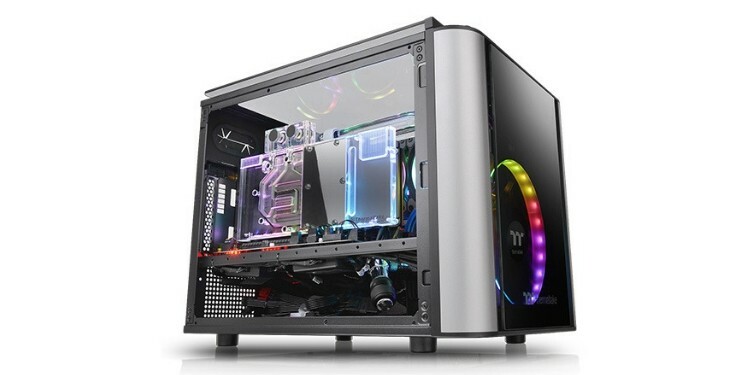 InWin is a Chinese manufacturer that has drawn a lot of attention in recent years by producing a variety of cases and products that offer a blend of great value with appealing and practical design. The InWin 301 is no exception to this trend and represents one of the best values on our list because of it. For starters, while looks are subjective, we like this case’s modern aesthetic and the illuminated I/O and honeycomb mesh panels look sleek. 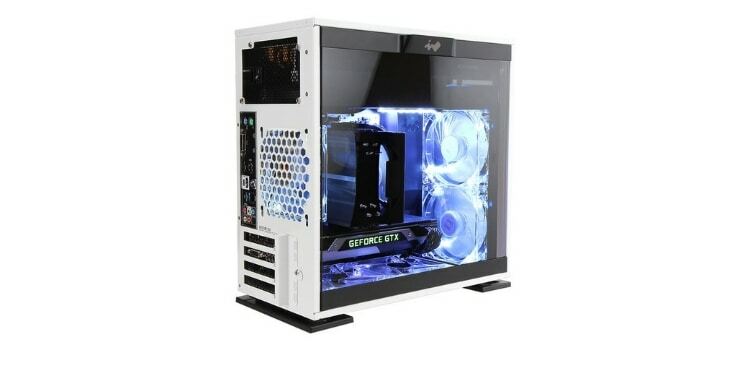 The large tempered glass side panel can be opened up and remove without any tools, making this a great case for those who are often tinkering around or opening up their case. Also, despite being the smallest micro ATX case on our list, the InWIn 301 can still fit up to a 240mm radiator at the front and a 120mm in the rear. This case also has a pretty unique overall layout with the power supply being mounted at the top and the option to have additional fans in the bottom that block one of the PCIe slots. In some cases such as an entertainment center PC, the computer needs to not only be tiny so it will fit into a media center, but should also be as quiet as possible so it does not disturb the viewing experience. If this is the kind of case you’re looking for, then the Cooler Master Silencio 352 is likely the best case on the market for you. The Silencio 352 has a number of features that make it easily the quietest small uATX case we’ve seen to date. For starters, it uses sound dampening foam in strategic spots around the side panels that absorb and redirect noise inside the case. The case also has several air filters to help keep dust out of the case. Oh, and it has a removable top cover. Keeping the cover on serves to suppress as much noise inside of the case as possible. Taking it off, however, offers more airflow for better cooling at the cost of slightly more noise escaping from the sound dampening case. Tempered glass, much like RGB, is often a love it or hate it affair. Many people find the wave of tempered glass panels coming out today to be a great advancement that lets them admire their hardware whenever they use their computer. If this sounds like you, and you want as much tempered glass as possible in as little space as possible, then the Level 20 VT from Thermaltake might be right for you. This case sports tempered glass on the top, front, and both sides of the frame. This gives you the ability to look at your hardware from almost any angle and looks great with some RGB lighting and fans added. On top of getting good marks for looks, this case also impresses in other areas including front I/O and storage. Getting four USB ports-- with some of them being 3.0-- is pretty good for a case of this size. Additionally, there are up to three spaces for 3.5” bays and three bays for 2.5” drives offering pretty good storage at this size. Some people want the case with the most cooling, others want the one with the most RGB, while others still are always on the hunt for something unique. If you fall into this latter group, then the Rexgear 1 might pique your interest. This case sports a unique look that comes in three distinct colors. The first options is a red and gold scheme that is very reminiscent of a certain Avenger. Another option is the black with orange trim that looks very industrial, and finally the white that offers a sleeker appeal. All three of these cases come with a huge 200mm fan in the front and a 140mm fan in the rear. Inside this case, each fan is plugged into one of the two onboard fan controllers which can be controlled using the knobs on the front. This lets you turn the fans up or down as you see fit. 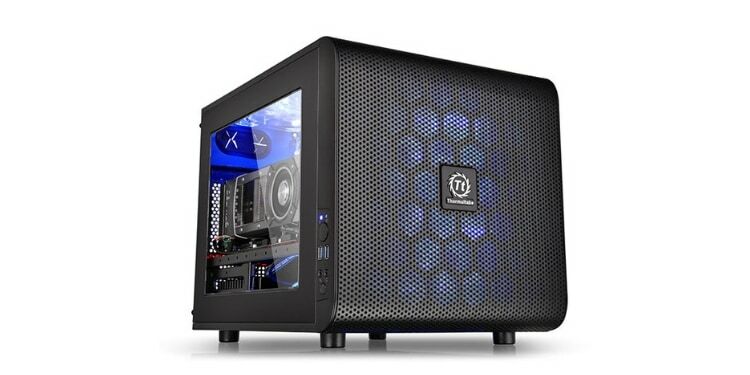 This case is also great for novice PC builders thanks to its large size and relatively spacious interior. You could even fit two 280mm radiators into this case. Smaller form factor cases can be very unforgiving for novice and veteran PC builders alike. The smaller cases offer less space to work in and make mounting fans, coolers, and especially cable management much more challenging. The Thermaltake Core V21 helps solve this issue with its unique design and features. It boasts the ability to have all of its side panels completely removed, leaving you with just the bare skeleton of the frame making it much easier to mount new hardware. 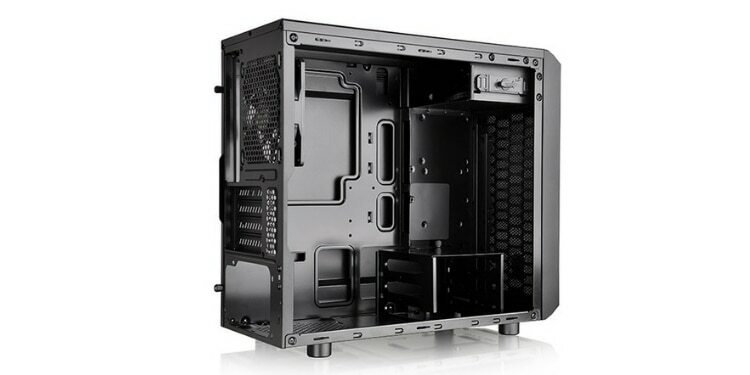 Additionally, the case sports a two-chambered design that offers added space in a compartment below the motherboard tray. This helps with keeping your cable runs clean and hidden, but also provides a place for water cooling reservoirs and pumps. For water cooling up to two 280mm radiators can be installed. From the factory, however, a single huge 200mm fan is included. If you’re looking for a case that looks sharp but won’t break the bank, then the Cooler Master Masterbox Lite is the perfect case for you. 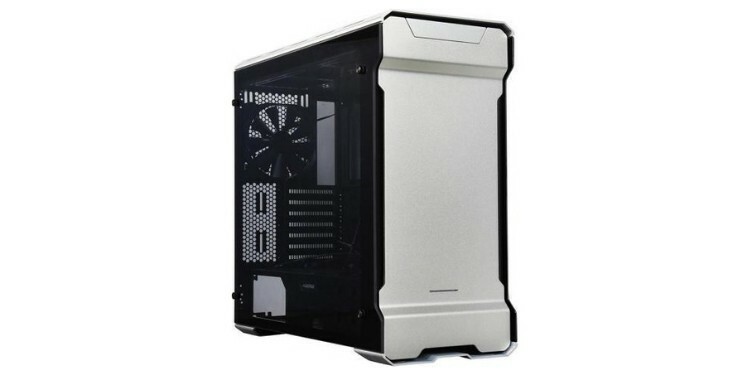 This case looks great with a huge tinted wide window and sleek lines on the front. The front panel looks like a solid piece of metal or plastic, but it is actually an additional window that has been tinted extra dark. This offers a cool subdued glowing effect to any lights or RGB fans that you put behind it. The case also has customizable trim that can be switched between a few different colors, adding to the custom looks of this case. That being said, great looks at such a low price do come at another cost. The Masterbox Lite has severely lacking drive bays options and front I/O compared to most other cases. There is only space for a single 2.5” drive and up to two 3.5” bays. Also, the front I/O only includes two USB ports, only one of which is USB 3.0. Last on our list, we have an mATX case that is ready for almost anything: the Thermaltake Versa H15. This case is the cheapest on our list by a good margin, but still manages to offer a solid user experience. 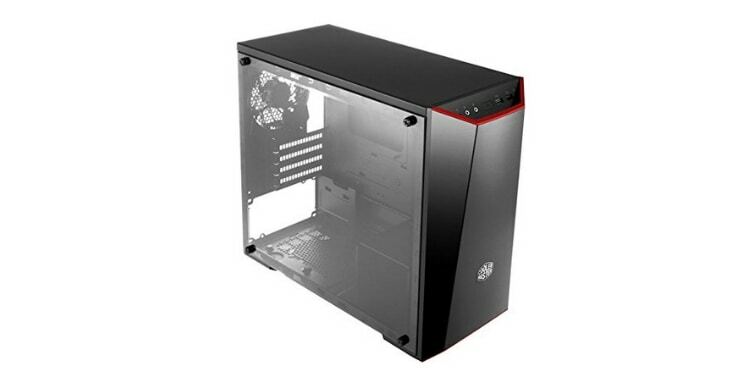 For starters, it comes with a single 120mm fan preinstalled in the back of the case. It can accommodate up to two more 120mm fans in the front as intakes, or have a whopping 240mm of radiator put in the front instead. 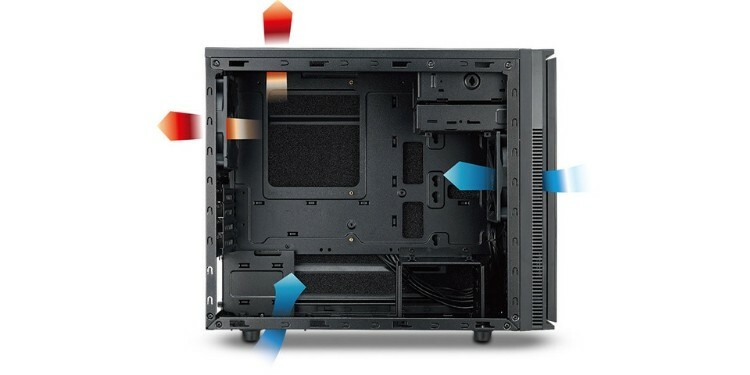 The top of the case has a mesh that, while it will invite in tons of dust, will also offer some added cooling performance, which is much needed if you stick with the factory setup of one fan. Also, while the base model doesn’t have a side panel window, it does sport a pretty modern and sleek look. That said, there is a version that looks even better, and has a side window, but will cost you about ten bucks more. As we mentioned, mATX cases are very balanced in their design offering much greater performance than mITX cases, but still saving much more space than a mid-tower. This means that the specs of the various cases on our list often vary significantly. To help you pick the best case for your situation we’ve included this short guide to help you know what to look for when shopping. One of the most appealing features of the mATX form factor is its diminutive size. Micro ATX cases can save a lot of space on the average desk and offer a more portable PC experience (even if not by much). If this is what draws you to the mATX form factor of case, then consider checking out the InWin 301. 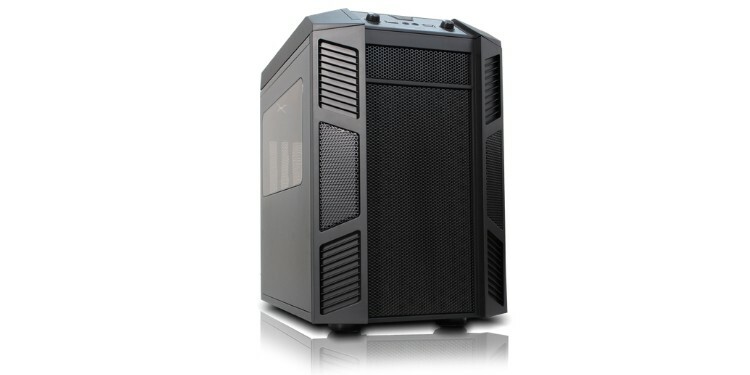 This case sports some impressive features all while being the smallest mATX case on our list. It can accommodate up to a 240mm radiator for water cooling and is great for performance. If you’d like to build a small form factor case, but are afraid of the building process, then the Thermaltake Core V21 is a great option since all of its sides can be removed, making it much easier to work within. It is important when shopping for any computer case to look at how many drive bays a case has and of which types each case has. Generally, there are three types of drive bay that you’ll see. 2.5” bays are used to hold solid state drives which are very fast, but are generally expensive and have less space. 3.5” drives, on the other hand, are generally for the more traditional hard drives which are quite a bit slower than solid-state drives, but generally more affordable and hold more data. 5.25” bays are used for things like CD readers, which are fastly becoming obsolete in modernity. If you’ve got a huge Steam library or movies and music collection and are looking for the case that will offer the most storage space, then the Cooler Master Silencio 352 is your best bet. This case boasts an impressive four 2.5” bays, three 3.5” bays, and a 5.25” bay. Cooling is something that is generally much more important in smaller cases than larger ones. 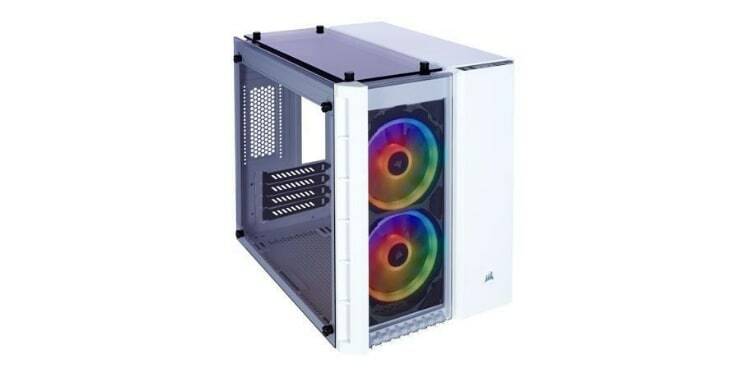 This is due to the fact that the smaller internal volume of air in the smaller cases will heat up more quickly and reach higher temperatures than a larger case where there is more air and the hardware can breath more freely. This can cause a runaway effect as the temperatures of the air inside the case increase, which in turn causes the hardware to run faster, which in turn produces even more heat. To remedy this issue many small form factor PC owners use water cooling. Water cooling can be set up so that each of the radiators, which are used for cooling, are breathing in fresh air to stay as cool as possible. In this case, the Corsair Crystal 280X is probably right for you. This case supports a huge variety of water cooling configurations, including up to three 240mm radiators. Even if you don’t opt for water cooling, make sure that the measurements of your GPU and CPU heatsink can actually fit inside of your case.